Atlanta – Microsoft Corp. pitched its software solutions and cloud offerings for business on the strength of its experience making consumer products, as it announced a slew of updates to core enterprise products including Dynamics, Office, Skype, and Azure. Addressing a packed sports stadium at Microsoft Convergence, the Redmond vendor’s annual conference for its business customers and partners, CEO Satya Nadella painted a picture of sea change for organizations in the digital age. He alluded to how the mainframe era saw the beginning of computers put to use in business, then the extension of computing throughout the enterprise thanks to the client-server model of delivery. But cloud computing is changing the game again. Before listing off the product announcements in store for the keynote, Nadella framed Microsoft’s identity as a company. Nadella’s keynote hit at the tension that many organizations are feeling in the bring your own device (BYOD) era, says Natalie Petouhoff, vice-president and principal analyst at Constellation Research. While technology has become easier to access and enabled my professionals to be productive, thanks to software as a service, it has sometimes cut IT out of the picture and created integration and security problems. Many professionals also have heightened expectations of enterprise software, due to the ease of which they’re able to use services such as Google and Facebook in their personal lives. After Nadella set up Microsoft as the company that could deliver consumer-style apps that are enterprise-ready, his colleague drove home the message a bit more pointedly. 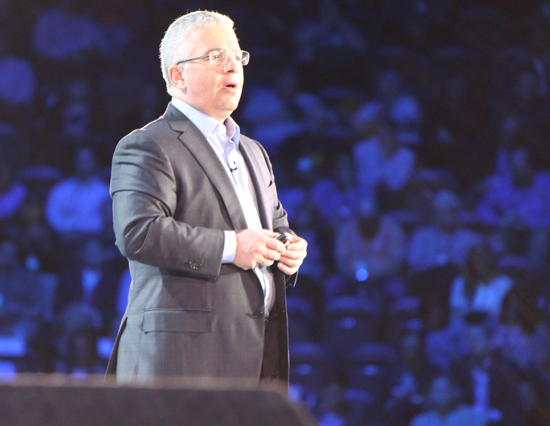 Kirill Tatarinov, executive vice-president of business services at Microsoft took the stage to tell the audience of professionals that their businesses were in need of transformation. Kirill Tartarinov, EVP of business services at Microsoft, says proactive service is what the world demands today. Microsoft has 15 years of experience when it comes to implementing back office solutions, and along with its partners are ready to help customers reinvent back-office processes. He described the roles of CIO and marketer as moving closer together – while CIOs are helping businesses adopt technology, marketers are also often enabling everyone within their company with the means to advance their brand. “This is all about delivering visible and measurable outcomes and being able to demonstrate impacts,” he said. While the tools may be there and Microsoft is certainly ready to help deliver them, the biggest bottleneck in realizing Nadella’s vision may lie in training, Petouhoff says. “There’s a shortage of people with the skills to use this software,” she says. “There’s this disruption happening in the digital process. But it always comes down to people. It’s always been true and it always will be true. You can have the best software on the planet, if people don’t use it, it doesn’t matter. Microsoft Azure IoT Suite is a platform offered up to companies that need to build their own software applications so their employees can better run their business. Coming out in a preview later this year, it will offer finished applications for scenarios such as remote monitoring, asset management and predictive maintenence. Windows 10 for IoT will offer universal applications and driver models for gateways to ATM machines. Power BI is now available worldwide as a part of Office 365. Its users can visualize business data with interactive dashboards and share their findings with colleagues. New Power BI connectors for data sources including Google Analytics, Twilio, and Dynamics Marketing will be available soon. The spring release for Dynamics CRM is expected by the end of the second quarter. It will contain more connections to Office 365, introduce Microsoft Social Engagement, a social monitoring tool. Office Delve is a news feed for your Office documents. 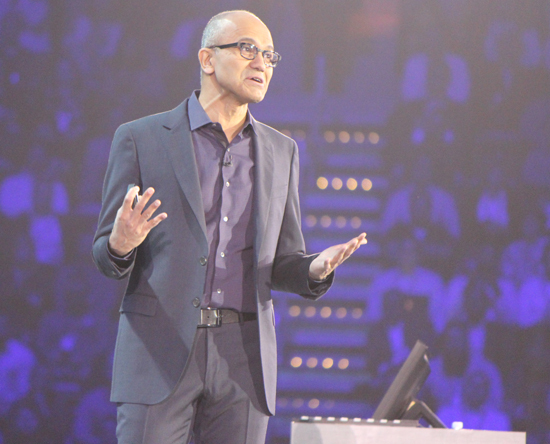 Nadella demonstrated it on stage, describing it as a Facebook-like view of your work day. Office 2016 is coming out soon, and the technical preview of the desktop software is now available. The software is expected for release in the second half of this year. Skype for Business was launched, replacing Microsoft Lync. The technical preview is now available and a new client, plus Office 365 access will be available in April.